Single story, 2100 square feet, 3 bedroom, 2.5 bath, plus den with open floor plan. Home is located in Sunridge Estates. Located 1-2 miles to river and casinos. Built in 2006. The front entrance to home is through a secured front courtyard. Nicely furnished with tile floors throughout except bedrooms, great room & den. Two central air/heat units and ceiling fans in great room, den, and bedrooms. Backyard features covered patio and rooftop sundeck/patio with casino/mountain views and great sunset views. Kitchen is fully equipped and includes refrigerator, stove top, oven, microwave, and dishwasher. Entering the home from the garage, you will find an inside laundry room with washer/dryer, sink, and separate work/office area. Kitchen area has a counter height table set with 2 bar stools; Kitchen island has 3 bar stools. Pool table in open dining area. Great room has large sectional sofa which can be configured to a full-size bed; entertainment center with 50" TV, DVD, and fireplace. Den has large sectional sofa with full-size pull out bed and 40" TV. The master bedroom has a king bed. Master bath has a double vanity, and a separate area with a large double shower and toilet. A separate, large walk-in closet is next to the vanity area. Bedroom #2 has two twin beds. Both share a 'jack and jill' bathroom with a double vanity and separate shower/tub/toilet area. The bathroom can be locked off to allow for one bedroom with a private bathroom. There is also a half bathroom in the hall area. Cancellation policy: No refund if canceled within 60 days. Utilities included: ALL utilities including Direct TV, home phone/long distance, and wireless internet. WINTER RENTAL: OCTOBER 1 thru APRIL 30 @ $1900 per month including all utilities and wireless internet. SUMMER RENTAL: 3 Night Minimum. MAY 1 thru SEPTEMBER 30 @ $275 nightly, $1700 weekly, $3500 monthly. We are a retired military family from Orange County and Monterey, California. 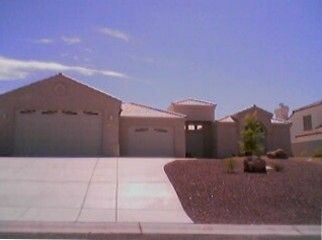 We built our home in 2006. After touring the model home, we knew this was the perfect, open floor plan for our family getaways. 10+ years later, I open the door and still say...I love this house😊. Our home is truly a home and not a party house. From the front courtyard entry to the spacious open floor plan to the backyard patio to the upper viewing deck, you will thoroughly enjoy the amenities of our home. This area is perfect for our family. We love boating, fishing, golfing, and playing the slots. If we plan it right, we can listen to a great musician playing in Laughlin. There's a little something special for everyone to do in the Bullhead City/Laughlin area. We enjoy our getaways to Bullhead City and hope that you will relax and enjoy your stay at our home. Enjoy sunsets, casino lights, and July 4 fireworks from the rooftop deck. Enjoy sunsets from the rooftop deck! Great house very roomy has everything you need to feel like home. We will be back again! Ray, We are pleased that your family enjoyed your summer getaways. Our primary focus is to create an environment where all guests can relax and enjoy our home. Property was as described and clean. Had no issues. Had a great time and the owner was responsive if I had any questions. The house was beautiful. It was large and set up very well for our family of four. We were visiting for an extended weekend to enjoy Lake Mohave. The house was close to the lake, so easy to get to, and so relaxing to come back to. We had zero issues during our visit and Cassandra was so easy to work with. We will be back! Beatiful home in a nice area and close to Katherine's Landing where we dock our boat. We were very happy with everything at this home. The owner Cassandra was very accommodating with my scheduling and any other needs that came up. The house is beautiful and very clean. It had everything you need to feel at home. I would definitely book for her again. We enjoyed our home rental for the week...was very convenient for us and located where we wanted to be...home was lovely and amenities were very nice...truly an enjoyable experience with this rental!!!!! We're happy that your family had an enjoyable stay at our home. Thank You!